Need help choosing the right size tablecloth? 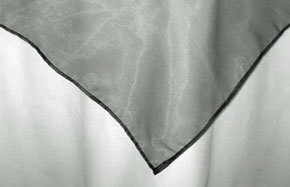 Our organza overlays come in many different sizes and colors. These beautiful table covers compliment our polyester tablecloths and are the perfect cloth for use at weddings and special events. Custom sizes and colors are also available upon request. These are superior quality table linens, NOT cheap imports. Made in the USA! Available in white, ivory, off white, black, baby blue, turquoise, navy blue, peach, taupe, deep purple, periwinkle, pink, fuchsia, silver, light purple, rust, deep coral, deep turquoise, gold, lilac, lime, sage, antique lilac, yellow, deep fuchsia, brown, red, burgundy, royal blue, purple, deep rose, olive, banana, and orange. 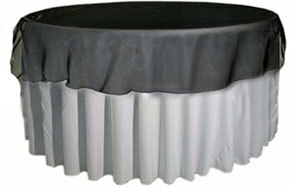 If you haven’t seen our organza overlays, then your event may be missing something. These beautiful event accessories are made with a high quality organza. The subtle weave creates a delightful texture that your guests will want to touch. The surface is also reflective so each color is seen in multiple shades. Different lighting will gently alter the way the fabric is perceived. Bright light will showcase the vibrancy of the piece while low lighting will create a subtle hue. Each of our organza products is made in the United States. They are designed to be more than a pretty decoration. Each item will help protect surfaces and can be easily cleaned in any household washing machine. You don’t have to spend more time figuring out when you will make your way to a professional cleaner to have your overlays washed. Newlyweds can focus on their honeymoon rather than event cleanup and professional party planners can decrease the hours spent after a celebration. We currently offer over 10 different sizes that start at 72” and go as large as 90” by 156”. Square, round and rectangular shapes are also offered so you can find a piece that fits the type of table at your venue. Simply measure your tables and find an item that offers comfortable coverage. Some pieces may fit different table sizes with a varied overhang. Rush delivery options are available for customers who need a quick way to enhance their seating arrangement at the last minute. The overlay isn’t the same as a traditional tablecloth. These products are intended to sit on top of a base layer. 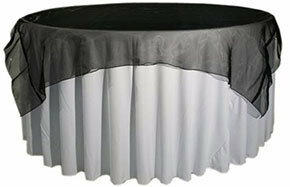 The delicate organza will create a luxurious display when paired with one of our high quality satin or polyester tablecloths. Square units can be used with round tables to form a unique arc and corner profile. No matter how you choose to use them, these overlays are guaranteed to give your guests the best place to celebrate! Our color options are nearly limitless. Visit each product page to see which hues are available. We have many popular tints as well as a variety of shades so you can find an exact match for your desired color scheme. Try a single color or choose products in two or three colors to create a diverse pattern that spans the entire layout in your venue. These items are intended for long term use, making them a great choice for professionals, restaurants and organizations. Individuals can store their overlays until the next party or holiday gathering. Organza looks stunning whether you have a handful of friends and family over or an entire hall full of acquaintances, coworkers and loved ones.